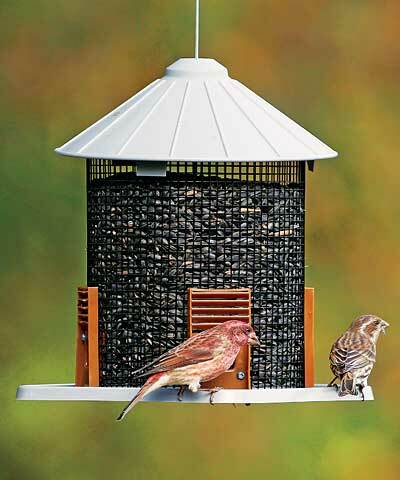 Start a farm theme in your bird garden using the Belle Fleur Sunflower Crib Bird Feeder. This adorable feeder mimics the shape of a traditional corn crib, with its cylindrical mesh reservoir and conical top. A square plastic platform completes the piece, offering birds a variety of dining spots. The center reservoir holds 3.25 quarts of sunflower seed or peanut chunks, which clinging birds can reach through the 0.25" square mesh. Four ports along the base of the seed tube offer even more avian snacking spots, while a plastic bottom platform creates resting areas. A raised plastic cone inside the feeder forms a baffle, directing seed toward the four base ports, and drainage slots around the edge help seed remain dry. The generous plastic cap covers the seed tube, and three locking tabs keep the lid in place easily. A metal rod runs through the center of the feeder for stability, and holds the included hanging cable. A loop at the top of this cable allows you to place this unit on a hanger or branch, while a port at the bottom enables it to mount onto a 1" O.D. pole. Its plastic and metal construction make it perfect for those new to birding, and its innovative design invites a wealth of feathered friends to the area. Enhance your backyard with a rustic feeding station using this Sunflower Crib Bird Feeder.